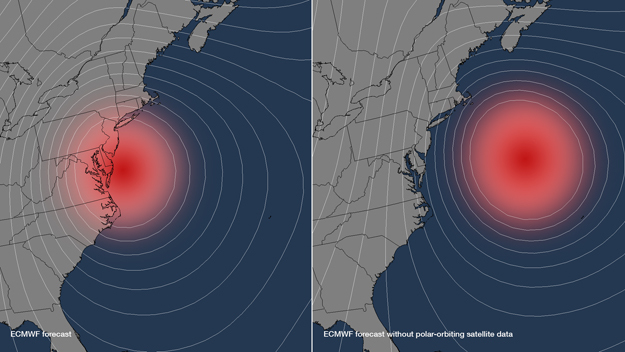 This image uses the model output from the ECMWF experiment, showing where Sandy was predicted to be located five-days out with the normal satellite data inputs into the model (left) and without any polar-orbiting satellite data (right). Both position and intensity forecasts were affected - Sandy stays out to sea without the polar-orbiting satellite data, and the closer isobar lines encircling the storm also imply a more organized and stronger system. According to a new study by the European Centre for Medium-Range Weather Forecasts (ECMWF), the NOAA forecasts of Hurricane Sandy's track could have been hundreds of miles off without information from polar-orbiting satellites. Rather than identifying the New Jersey landfall location within 30 miles five-days before landfall, the models would have shown Sandy remaining at sea. "This study shows the value of polar-orbiting satellites in developing life-saving forecasts with longer lead times," said Dr. Kathryn Sullivan, assistant secretary of commerce for environmental observation and prediction, and deputy NOAA administrator. "Had we thought the brunt of the storm was going to stay out in the Atlantic, or if residents had only a day to prepare or evacuate, the results would have been even more devastating." The ECMWF is an independent, intergovernmental organization supported by 34 European nations, providing global medium-to-extended range forecasts. Data from polar-orbiting satellites consist of accurate, high-resolution atmospheric temperature and water vapor information, which are critical inputs to forecast models that help predict the intensity and location of severe weather events, such as Sandy -- several days in advance. These spacecraft are called polar-orbiting, because they circle the earth from pole-to-pole, providing full global coverage daily as the Earth rotates beneath them. On October 29, Sandy made landfall just south of Atlantic City, N.J. It morphed into a hybrid storm, bringing strong winds, heavy snow, rain and a powerful storm surge to areas along the Eastern seaboard. "The global observing system based on polar-orbiting satellites, along with other observation resources, numerical models and the experience and skill of our forecasters, gave NOAA an advantage in tracking Sandy - from tropical wave, to hurricane, to post-tropical cyclone," said Louis Uccellini, director of NOAA's National Centers for Environmental Prediction in College Park, Md. NOAA operates two types of satellites; polar operational environmental satellites (POES), which fly 540 miles above Earth's surface, circling from pole to pole, and geostationary operational environmental satellites (GOES), which remain stationary above the equator at an altitude of 22,300 miles. GOES spacecraft orbit at the same speed as the Earth's rotation, resulting in near continuous observations of a fixed region. As a result, GOES provides constant imaging and POES, the subject of this study, offer full global coverage -- with improved spatial resolution and additional instruments to measure atmospheric temperature and water vapor. NOAA is working with its partner NASA to develop and launch the next generation of polar-orbiting satellites, the Joint Polar Satellite System (JPSS). Last year, NASA launched the Suomi NPP satellite, which is the bridge between NOAA's current polar-orbiting satellites and NASA's current Earth Observing System satellites and JPSS. The JPSS-1 satellite is set to launch in early 2017. "Our top priority is ensuring NOAA's National Weather Service can maintain accuracy and timeliness of its forecasts and warnings today, and into the future," Sullivan added. "The only way that can happen is with a robust satellite fleet."